Once again the Met guided its expensive new production to the DMV (that is, stage director David McVicar) on New Year’s Eve and if the vehicle didn’t stall out like the last time it provided sufficient evidence that the seemingly omnipresent “driver” might helpfully have his NYS license revoked. But then again the Met got exactly what it asked for: a safely opulent, resolutely unchallenging Tosca that was far from shabby or little but couldn’t have been less shocking… and that, of course, was its biggest failing. Despite being hobbled by poor conducting, its bland cast earnestly went through its absolutely predictable motions but then that’s about the last thing one wants—no fire, no danger, no holds-barred flamboyance that can make Tosca a night of thrilling music-drama. Lots of enthusiastic applause but no boos greeted McVicar and his team (just what on earth does Movement Director Leah Hausman do?) when they appeared during the final bows, but then in my experience that is always the case. His “tasteful” conservative approach might feature a few tiny, tepid half-baked regie flashes but it rarely raises any ire. I suppose there’s a collective sigh of relief that his productions never require one to think much or question one’s decades-encrusted expectations. Certainly that was the case with Tosca: there was scarcely a single important moment that didn’t go exactly as one might have foreseen. It was hard to discern what weeks and weeks of rehearsal had accomplished. Most of what transpired on stage Sunday night looked like it could have been thrown together by a Met staff stage director in a week or less. Before the premiere we were bombarded with lots of “news” about how hard the production team had worked to make its version historically accurate and “authentic.” In fact, the Arnold and Marie Schwartz Gallery Met now features “John Macfarlane—Tosca: The Rome Drawings,” a show of 14 drawings, two paintings and a pair of sketches inspired by the set and costume designer’s trip to Rome in April 2015. He needed to visit Sant’Andrea della Valle and Castel Sant’Angelo because “it is essential to the plot of the opera that you show their scale, grandeur and unique atmosphere” and “the resulting theater design has [emphasis added] to be architecturally accurate.” All in all it didn’t look all that much different from the discarded Franco Zeffirelli production… but that was the whole point after all, no? OK, but why are all three sets on an incline of about 15 degrees? What the heck was going on in act I when the grand religious procession proceeded along a hidden peripheral side aisle on the far left after which the chorus assembled facing at an angle the offstage ceremony? Why did entire right half of the stage remain empty until Scarpia climbed Mario’s scaffolding and thumped his chest three times? Why did light stream in the high side windows of Scarpia’s quarters at the Farnese palace… at midnight? As in last fall’s Norma McVicar can’t seem to resist putting supers onstage to distract one’s attention from the principals. During Tosca and Scarpia’s crucial first interview a mob of stylishly dressed extras out on the day’s “Tosca-tour” appeared to eavesdrop and gawk. While Mario poured out his heart in “E lucevan le stelle” a guard on each side of the stage lurked, presumably because the prisoner couldn’t be left alone, but then left when Tosca appeared so the pair could sing their duet alone. Huh? Perhaps it was a result of the team’s tireless research but why did Mario face the firing squad holding a lantern next to his face? To make sure they could see him? But isn’t it supposed to be dawn? 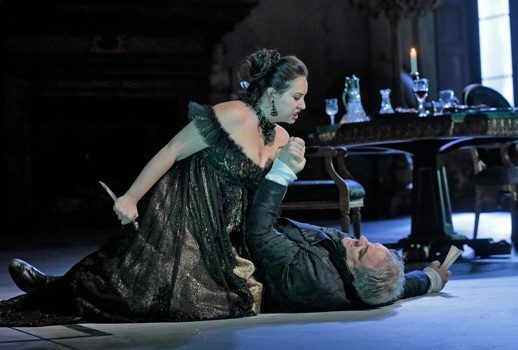 Much has been made of how Tosca’s gorgeous black gown in the second act with daringly low décolletage might be less than tasteful for a performance in front of the Queen. But what of her traipsing around church with nothing on her head or carelessly dropping her white (!) shawl on the church’s paint-splattered floor not once but twice and then blithely picking it up and wrapping it back around herself? But these and other details added by DMV had me scratching my head—why? Just why? Otherwise every item on the usual Tosca check-list was dutifully carried out sans surprise. Drink from goblet—check. Spy knife—check. Pick up knife—check. Stab Scarpia—check. Search for safe conduct and find it clenched in his warm dead fist—check. Put candles on each side of his head and crucifix on his chest—check. More than anything the ghost of Luc Bondy’s 2009 Met production haunted the evening. One imagined everyone involved forced to watch a copy of the HD and then swear to unerringly avoid any trace of that “sacrilegious” version athat apparently so offended much of the Met public. But I was more than engrossed the three times I saw it because the performers invested that often-misguided vision with an intensity missing Sunday night. Although vocally miscast, Karita Mattila couldn’t have been boring if she tried even without the usual Scarpia-murder-shtick and later that first season the incendiary team of Patricia Racette, Jonas Kaufmann and Bryn Terfel raised the roof and no one minded the Bondy that night at all. More recently Angela Gheorghiu mostly ignored Bondy’s blocking and just did her own thing but it was always fascinating. Unfortunately last night Sonya Yoncheva, Vittorio Grigolo and Zeljko Lucic instead just seemed like pleasant, rather dull people caught up in a spot of bother. I for one feared the worst for Yoncheva whose commitments in Paris kept her away from rehearsals for her very first Tosca until mid-December. Yet hers was the most impressive portrayal. Yes, sometimes the top can thin precariously (she was clearly tired by the third act) but at important moments it rang out with point and clarity. The voice was surprisingly big and full and her attractively smoky rich timbre occasionally took on an appealingly covered quality in the middle. She dug into a pungent chest register much more than I would have expected, sometimes even more than needed. I hadn’t heard her live in a complete role since her first Desdemona two seasons ago and the voice has continued to grow as has her command of the stage. If her characterization was well-executed, it lacked that diva flair and fiery temperament one might like to see. This was a good girl (not yet a woman perhaps) brutally harassed by a bad man but I wasn’t entirely convinced that she had the gumption to kill him to avoid his advances. Possiblyu she will grow in the role as the run progresses; the outline and instincts are already there. But it doesn’t seem to me that she’ll ever be an ideal Tosca as her basic persona thrives in more pathetic roles. Her “Vissi d’arte,” if less from perfect, was the most affecting moment of the evening. Unfortunately she’ll have to contend with the same tenor and conductor throughout January culminating in the HD on January 27. After his fevered yet impressive Hoffmann in September I harbored some hope that Grigolo had evolved into a more disciplined artist but there was little evidence of that in his first-ever Cavaradossi. What little beauty the voice had has now vanished but it retains its potent high notes which are now pumped out to showy effect with him sweatily rising up on his toes. 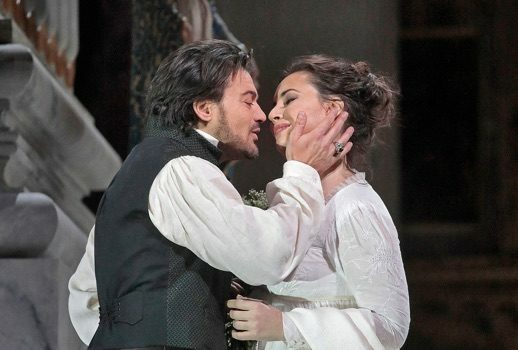 After an awkward “Recondita armonia” he persuasively portrayed Tosca’s horny lover in the first act but his intereactions with the debuting Christian Zaremba (Angelotti) were unusually and unconvincingly frantic. I doubt anyone has ever yelped so histrionically while being tortured off-stage and his “Vittoria” was indeed thrilling but he made sure you knew just how much effort he was putting into it. His lachrymose prosaic “E lucevan le stelle” was probably the weakest rendition I’ve ever heard of this usually sure-fire show-stopper. While it’s perhaps unfair to “review” someone’s bowing he’s long been known for his over-the-top, self-aggrandizing hijinks. The one last night however must stand as the most excruciatingly egregious ever, yet he was clearly reveling in the cheers of the many who respond delightedly to his wild antics. Perhaps because he’s become so ubiquitous at the Met, many seem to regularly disdain Lucic but I tend to like him. While he can sometimes appear unengaged (his blasé Rigoletto was particularly unfortunate) I find his smooth secure baritone more appealing than a lot of the others the Met has offered up in recent years. But his lack of dramatic intensity and menace made for a less-than-ideal Scarpia. The grand ending of the first act found him underpowered and in general he lacked bite and snarl making the Baron far less dangerous than he should be. Despite having to juggle an alarming amount of comic business, Patrick Carfizzi was an endearingly full-voiced Sacristan, a nice change. The off-stage Shepherd Boy seems to have been a Girl—Davida Dayle—but I can’t say she made much of an impression as there was so much stage business going on I couldn’t concentrate on his/her plaintive song. Brenton Ryan’s ugly Spoletta was completely overshadowed by Christopher Job’s tall, threatening Sciarrone. Job clearly caught the director’s eye as the opera’s final tableau was all about Sciarrone staring blankly into the auditorium presumably as unimpressed as we were by Tosca’s dull flop of a dead-drop jump off the parapet. Having been very impressed by his recent Thaïs, I was stunned by the disorganized, unidiomatic conducting of Emmanuel Villaume, which proved the evening’s greatest misfortune. Perhaps because the slanted sets required that the prompter’s box be built up to more than twice its normal height, musical coordination throughout the performance was woeful and during many moments the singers seemed at war with the pit rather than at peace. Far too many passages threatened to collapse under Villaume’s slow, unyielding tempi; the luxurious and soulful rubati so characteristic to Puccini were rarely in evidence. Dare I admit that at more than one point I even missed him who shall no longer be named? By chance I happened to be in Tanglewood this summer and heard three-quarters of this cancellation-plagued production’s original line-up do Puccini. Andris Nelsons’s slow sumptuous conducting lacked punch and momentum in the Boston Symphony’s semi-staged Tosca second act, but his wife Kristine Opolais’s cowed, skittish heroine was actually better sung than I’d expected. It came as a shock when she suddenly morphed into Joan Crawford in Strait-Jacket for Scarpia’s murder but then Terfel’s icky, creepy Baron surely merited such an extreme extermination. But all in all other than for the dire Villaume I don’t know that Met audiences need to be too bereft about the cast-changes particularly Yoncheva’s often gorgeous if small-scaled prima donna. But more than once I thought back with longing to Kaufmann’s ringing Mario seven years ago in that “horrible” Bondy production I didn’t miss so much after all.